PJ #65 " THE LAST GREAT PLAGUE UPON MAN: AIDS AND RELATED MURDER TOOLS ", chapter 3 & 4. "The truth shall make you free. " Ah, indeed the headline on the paper has caused ones to rush to Bibles and quotation dictionar­ies to find if it is "will" or "shall" or, or - -. Does it matter a whit? Either way--IT SHALL/WILL MAKE YOU MAD! There are many ways to "express" truth: "Truth is a flower in whose neighborhood others must wither." So what is "truth"? It is that long clean clear simple undeviable unchallengeable straight and shining line, on one side of which black is black and on the other white is white. But in your day of expression--it has become a long and confused angle placed in definition upon "opinion"--which is usually uninformed and lacking most as­pects of Truth itself. There is only ONE Truth--but an infinite number of ways to reach it. One thing is surely Truth: you will never get Truth from your Government, your Media or a Lawyer! So be it. Wokini, please, this week is filled to overflow with lawyers and harangue, lawsuits and lies--so, shall we move directly into our subject so that we can have readiness for contribution to the new paper? I find that we are now approaching the most important material for the fundamental experience of life itself as ex­pressed in the physical manifestation. The very life structure is DOW altered, obliterated, changed and manipulated. You MUST KNOW IF YOU ARE TO SURVIVE WITH "SOUL" INTACT--THE PLAN IS TO OBLITERATE SOUL FROM LIV­ING STRUCTURES. Also, Wokini, it is time to begin to restructure the PLEIADES CONNECTION banned books. I am not going to delve into the "God" subject as is presented in four of them--but we will start with the ones most desired banned at this time of experience--AIDS, THE LAST GREAT PLAGUE. The HIV virus is noth­ing more than a manipulated structure and you can do nothing about it or any of the other "last plague" organisms until you know the truth. There are some exceptional volumes in print which bear reading but I have not time nor inclination to offer them here. We shall effort to integrate the "old", updated, along with this information being offered herein. We shall ef­fort to get this back into print as quickly as we find interruptions in the legal scheduling. I am weary of the "Evil Empire" in the form of proclaimed "friends" who stab the backsides--but we shall play it out as necessary. IF TRUTH FALLS, READERS, WHO SHALL PICK UP THE PIECES? OR, WILL THEY LAY TO DUST AND RUST WHILE SATAN ENSLAVES YOU--WITHOUT SOUL OR MIND? THE CHOICES ARE ONLY YOURS. I believe, in this newspaper edition, the staff is presenting an idea of "sponsorship" of JOURNALS. You will have to check it out for I haven't paid attention. I believe, however, that what is suggested is that one or a group sponsor the publication of given JOURNAL printings or reprintings. Someone has men­tioned prices but you will have to check it out, please, for I don't attend those things very closely. I MENTION IT HERE BECAUSE: THE REWRITING AND THEN PUTTING TO PUBLICATION OF THE ABOVE REF­ERENCED JOURNAL IS BEING SPONSORED BY DR. PIERRE CLOUTIER--A BELOVED FRIEND AND "SPARRING PARTNER". HE HAS MADE GENEROUS CONTRIBUTIONS IN SHARING AND SUPPORTING THIS WORK FROM ONSET. THERE ARE NO WAYS TO AC­TUALLY ADEQUATELY THANK THESE FRIENDS--BUT WE SHALL TRY. WE CAN REFERENCE SUCH PARTICIPATION IN ANY WAY A SUPPORTER WISHES--EITHER WITH NAME, INITIALS OR ANONYMOUSLY. I HONOR YOUR PRIVACY AT ALL TIMES. "I" CHOOSE THIS PARTICULAR VOLUME IN HIS HONOR BECAUSE HIS WHOLE EXISTENCE IS IN THE HEALING ARTS AND FEW REMAIN WHO SERVE IN TRUTH IN THOSE PROFESSIONS, CALLED HEALING. YOU ARE CON­TROLLED BY THE VERY MANIPULATORS OF THAT WHICH WE HEREIN SPEAK. QUOTING: Cristusstaat International, PO Box 5643, W-8700 Wuerzburg, Germany. Direct interventions in the genetic make-up are already com­mon practice in veterinary medicine and stock-breeding. How­ever, they are legally forbidden on man. And yet the technical know-how could already now be used on man. Hasn't it always been so, that what is technically possible will soon be put into practice? Does this possibly take place in secret already? In a recent television film there were two kinds of human beings: naturally-fathered ones and others whose genetic make­up was manipulated beforehand in test-tubes. The naturally-fa­thered ones were people of inferior quality; the others who were fathered in test-tubes were the great ones, the leaders and the scientists. The possibility of a direct intervention in the human body cells has already BECOME REALITY TODAY. This direct manipulation is thus a supplement to the indirect one which takes place via substances in medicines, in the food and in the air. The intervention in our physical genetic make-up gives the demonic forces, the opponents of God, the possi­bility to block our spiritual heritage. How can we under­stand this relationship? In all probability, gene fragments which are smuggled into the human genetic make-up can change the programmes which are stored in the human brain. One knows, for example, that our emotional life is controlled by so-called neuropeptides. [C: KNOW that in the Gaiandriana these "peptides" are brought into perfection of the original "natural" cellular structure of your individual DNA blueprint. It will be from the protec­tion of your own cellular "mind" (brain) structure that you will be able to exist unaltered. Therefore, neuropeptides (peptides by any label) are very, very important.] Peptides are elements of proteins. Our genes have the task to produce el­ements of protein--also the kind found in neuropeptides. If the DNA-composition of certain genes is changed, the production of peptides will also change accordingly. If, due to such a manipulation, the above-mentioned neu­ropeptides which influence our brain are changed, then the fol­lowing can happen: The substances which control our emo­tional life are no longer produced correctly--and this will lead to a blockage of our emotional life. This could, for ex­ample, mean that one loses the inhibition to hurt another person, or that someone is blocked in his readiness to help a suffering person or someone in need, or that one carries out the orders of an authority against one's own morals, because the conscience is eliminated. Indeed, the feelings and sensations are the bridge to the divine within us. If we no longer discern our feelings, that is, if we no longer can feel ourselves, then it is no longer pos­sible to recognize our selves. This means that we no longer get to the causes which are still in our soul. An additional consequence is that, since the sensations and the conscience are blocked, man continues to violate the divine laws without having the feeling that he sins (errs). Through this, he bur­dens his soul more and more. This is exactly what the demon wants, because in this way he receives energy. If the path of self-recognition and clearing up of causes is blocked, we no longer have access to our divine heritage, to our true being. Clearing up causes, therefore, needs recognizing one's guilt, repenting, forgiving, asking for forgiveness, making good and no longer doing the same or sim­ilar mistake again. Repentance, however, implies: To feel without our own hearts the pain which we have caused to our neighbor. This re­pentance can only be reached via the emotional level. How­ever, if our feelings and sensations are blocked, we no longer recognize our sins and, even more, we no longer repent of them. A person in such a state is spiritually dead, because he is manipulated. And still another aspect has to be taken into consideration: Man and his soul form a unity and thus have a well-defined life programme which they bring along into this world. The bur­dens of the soul from previous lives, therefore, are of great significance. In fact, the genetic information which differs from man to man forms the link between soul and body. Changing the genes also changes the life programme of man and is thus an interference with the soul debt of man. It cannot be dissolved this way, but is pushed back into the soul and will break out at a later time. Thus, man has in­flicted a new and additional burden on his soul. The interference with the human genetic make-up is another attempt of the demon to gain control over the people and thereby over this Earth. After all the demonic seductions he has staged thus far in the history of mankind--including the splitting of the atom--he now tackles gene manipulation. It will be his LAST ACT. It will not bring him the de­sired rule over GOD, but the decline of the old world. Question: What might be the effect on me, if I eat cheese which contains gene-technically produced rennin enzymes for break­fast? Answer: Of course, the gene engineers say that it has no effect whatsoever on human life. This, however, is unlikely for we know, for example from tests on insects, that genes are transfer­able. We speak here of a horizontal gene transfer. This means that foreign DNA components can be implanted into other cells. This, however, has unforeseeable consequences for life. Question: Does science know about this? Answer: In individual cases perhaps not. But the horizontal gene transfer, that is, the implantment of foreign DNA into the body's hereditary substance is scientifically PROVEN. Question: Can the dissemination of gene fragments be controlled at all? Answer: IT IS NO LONGER CONTROLLABLE "NOW", because the dissemination of genetech products has already reached an extent which can no longer be clearly seen. Today, gene technology already presents a considerable economic factor in the Western world. One can no longer talk about supervision or even control in this field. Question: How can gene fragments gain entry into the human being: Are there other possibilities than via the food? Answer: By now, there are gene fragments in the water, in the sewage and in the air. There are many other possibilities of taking them in, not only via the food. Once they are inside the body, they then go where they fit. [C: The point of Gaiandriana is that it takes on the DNA (original blueprint) of any normally structured cell which has been invaded or in any way altered through manipu­lation. The Gaiandriana simply moves within each cell and in the case, for instance, of a virus, destroys the zinc molecule which holds the "cap" on a virus--destroying the virus by its "collapse" and THEN, uses the debris as food for fuel. There is nothing very scientific about it--it is a totally natural thing. The body immune system builds itself to proper levels of function and simply takes care of foreign DNA elements. It simply reproduces the perfection of the original blueprint structure and destroys the alien intruder. It's a perfect plan of GOD to protect His creations--whatever they be. Would this not simply enhance an intruding genetic im­plant? NO--because there is an original blueprint as indi­vidual as is every fingerprint. In a "clone" for instance, the cellular structure may well be qualified--but, in a clone, you have already severed the "soul energy" ties to the being in point--or, at the very least modified the connection to give the same sum total. What would happen if our brave scientists, our politicians who are positively convinced of gene engineering and our "responsible" churchmen were the first ones to volunteer for such gene-manipulative experiments so that within the next five or ten years we can observe on them the benefits of gene ma­nipulation? For example, our politicians who have just passed the new regulation, "NOVEL FOOD", could share [show] at all receptions and banquets that they prefer to eat gene-manipulated foods. Since they claim that gene engineering has no side-ef­fects whatsoever, they could set a good example. They cer­tainly have to be afraid of nothing. What do you think, dear reader? If ethics and morals of a truly Christ-type of life are no longer taken into account in science and technology; if the only question remains what is technically feasible, but no longer what is Christian--then we have to be afraid that mankind will face a gloomy future. A future which will no longer be subject to the divine order but to an order made by people. And this means: a satanic order. Whoever is prepared to submit to this slavery, can do so. The one who does not want to, should become attentive and protest against each kind of manipulation of the human genetic make-up. FOR IF MAN PLACES HIMSELF ABOVE GOD, THEN HE HIMSELF HAS BECOME THE DEMON! If we allow our genetic make-up to be tampered with, then we may outwardly become healthy. If, however, every illness is determined in our soul, how can a gene-manipulated person then regain his health? This means that through the manipulation of the physical genetic make-up, the illness is again pushed back into the soul. The causes we have created are still there; they even increase, because we continue to think and to do the same or similar things. Would you buy groceries if they were labelled "gene-techni­cally improved"? If not, then you KNOW the reason why such labels are missing! We pose the question: Is gene manipulation in the will of God? If not, what do the guarantors of the ecclesiastical institu­tions then say about this? Why does not, at this point, a storm of indignation break out? For the one who wants to live in a Christian way cannot sit back and silently watch how man once again intrudes heinously into God's creation and how our soul shall be bound to the satanic for eons. From the churches we find statements such as the following: In 1986, the Protestant Lutheran Church of Germany formulated ten theses on gene technology. In a summary by the bishop in charge, Dr. Karl-Heinz Stoll, we can read among other things, "It is neither possible nor sensible, or even an ethical necessity, to dispense with all technical-scientific possibilities and to go 'back to nature', nor is it responsible to blindly affirm progress." "We can no longer do away with or forbid gene engineering, as several people suggest. It all depends on us and society how we will deal with the possibilities which it offers to us. The sci­entists have a great responsibility, but ours is not minor. In or­der to assume responsibility, we have to inform ourselves be­yond all exaggerated optimism or pessimism." What is meant by the expression "exaggerated pessimism"? Does it perhaps mean that a bit of gene engineering for "humane" purposes is permitted from the Christian point of view? "The basic tendency of genetics and eugenics for influencing the hereditary process, in order to further the good and to elimi­nate the bad, is blameless from the ethnic point of view." With regard to modern gene technology, Pope John Paul II said in his speech of October 23, 1982, in front of the Papal Academy of Sciences that one can hope "that the new techniques for the modification of the genotype in special cases of genetic and chromosomal illnesses present a cause for hope to the majority of people affected by such illnesses. One also has to consider that specific illnesses, such as sickle-cell anemia, can be healed through gene transplants... The research of modern biology gives cause for hope that the transplantation and transmutation of genes are able to improve the state of health of those who are affected by chromosomal illnesses; in this way the smallest and weakest human beings can be treated still in the womb or imme­diately after birth." (quoted from Reiter, Johannes: Ethical Im­plications of Genetic Research n.d.). "Transplantation and transmutation of genes" thus is au­thorized by the Catholic Church! And so the church breaks its own teaching: For where is it written in the Bible that we are allowed to interfere with the creation in order to become "sound" through this crime? Rather, it is written, "And God saw everything which He created, and behold, it was very good." (Genesis 1:31). By affirming the transmutation of the components of life, the church corrects God and places itself over Inn. it is known that in the field of gene engineering, animals have to suffer as production centers for manipulated medicines. What would Jesus of Nazareth have answered to the question whether it is according to the law of God to let a cow suffer as a bio-re­actor for all its life? Wouldn't He possibly have said: "What you have done to the least of My brothers, you have done to Me?" For the animals, too, are our neighbors, are our brothers. In case the churches have misjudged the development, wouldn't a clear "NO", at least now, be required in view of the eery scenario of an expanding gene technology? Why is it still lacking? One cannot help thinking that gene technology is al­ready in the hands of big business. IT IS KNOWN THAT ESPECIALLY THE CATHOLIC INSTITUTION HAS IN­VESTED ITS UNKNOWN FORTUNE IN THIS BIG BUSI­NESS. Does it once again seem that birds of a feather flock to­gether? WHEN COMES THE "PATENTED" MAN? The patent is a document which grants a monopoly for the use and commercial production of an invention. In order to be patentable, an invention has to be new; it must not be self-evi­dent for acknowledged experts in this field; it must be useful in its commercial application. In this point there is mutual agree­ment. But scientists, industrial companies, politicians, legal experts, environmentalists and philanthropists disagree over the question of what is patentable. In the 70s the line was still clear: The European patent agreement ruled out the patenting of plant vari­eties as well as animal species and animal breeds. Were their consciences still active at that time, or was it sim­ply not imaginable what gene engineering would render possible one day? For some years now, it has become apparent that gene research and its application will become a multi-billion dollar business. What has happened after that? The legal conception that plants and animals are not patentable has undergone an amazing change from the former express banning to the current licensing. The European courts have changed their conception after the US Supreme Court was first in deciding that everything under the sun is patentable. For gene technology this means: Genes, too, are patentable, and thus so are transmuted plants, animals and human cells. In Munich, for example, the American com­pany Dupont was granted a German patent for a so-called "transgene" mouse. According to a US report, the American brain-researcher J. Craig Venter of the National Institutes of Health in Bethesda has identified over 2,300 human genes, for which patent appli­cations have already been submitted. The same is true for the gene which regulates the composition of human milk. With the manipulation of this gene the mother should become a producer of medicine and the child should already take his "medicine" with the mother's milk. If years ago someone had uttered fears of this kind, they would simply have been dismissed as science-fiction stories. But the possibilities might become reality. It is an eery develop­ment with gigantic consequence. It is initiated by those who--on their part manipulated by darkness--pull the strings in the back­ground of world events. It is their aim to prevent man and his soul from returning to God and to create the insensitive and controllable human being which serves its demonic in­terests. Even the supporters of gene engineering who only want to see "progress" should give more thought to it in view of the un­foreseeable consequence for human life, unless they only have an eye for the billions of dollars which gene technology begins to yield. Consumer groups and environmentalist organizations have begun to establish some sort of "militia" against the gene lobby. It's doubtful whether their protest will have any effect. Their adversaries in politics, science and industry are all too powerful. And they determine the line of gene politics. An EC directive has to be incorporated by each of the twelve member state's parliaments into a national executive law. This would swirl up more dust. An EC decree, however, is a law which becomes directly valid in the member states as soon as the European Parliament does not reject it with absolute majority and the EC-Council of Ministers approves it. "WELL, I'LL NOT GET TRAPPED!" In view of the unforeseeable dangers which gene manipula­tion will bring to mankind, the only thing we of Christ con­sciousness can do is to purify our soul from its burdens; this way our body can be protected, too. The only path to this end is the actualization of the Ten Commandments and the Sermon on the Mount. By putting into practice the teaching of these ways, we follow God. Thus, our soul is being purified, and the Light of God irradiates the physical body, strengthening it. Therefore, the only support, the only salvation, in this time is the Christed pathway--through the actualization of the lessons given as within the Ten Commandments and such other teach­ings as follow the Sermon on the Mount. These teachings are given forth by every God-valid religion, race or creed on the globe as far back and shall be as far forward as perceived "time" exists. 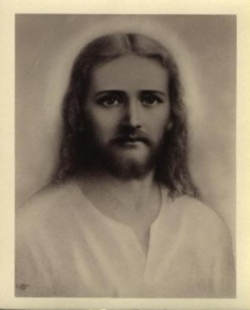 Christ has revealed, anew in the present time, the Inner Path to mankind. The Inner Path shows us how to put the divine laws into practice in our everyday life, so that we become divine again. This is the lived Sermon on the Mount. On the Inner Path, the journeyer learns to recognize himself--his human ego--and to let go of it, step by step: his human feel­ings, sensations, thoughts, words as well as his passions and longings. The one who seriously walks the Inner Path and works on himself day by day with the help of Christ will gradu­ally cast off his human heritage, the upper communications and subcommunications of his human ego. "I said: follow Me!' This is why each soul has to recognize this Inner Path and also to walk it. Happy the soul which--al­ready in the earthly garment--in the life limited by time and space--walks this path of purification and completes it for the most part! There is only one path to God, our eternal Father, the path within. As the Christ of Nazareth said: 'The Kingdom of God is within you.'" In the final analysis, this path offers the only alternative in this time, which is a mighty time of radical change. The demon once again stands up with might in order to save his territory, the Earth. But from the revelations of the Old Covenant, from the Secret Revelation of John, and from today's revelations of the spirit of God we know that the end time will not bring the rule of the demon over God, but a new heaven and a new earth. Thank you, Maurine, for your sharing and again, we thank you for the beautiful painting of our brother sent some years past. I am greatly honored as you ones find truth and substance within the piles of "nothing" save garbage material. Blessed are your leaders in Truth for ye shall show your brothers home. That you need God more than anything, you know at all times in your heart. But don't you know also that God needs you--in the fullness of His eternity, you? How would man exist if God did not need him, and how would you exist? You need God in order to be, and God needs you--for that which is the meaning of your life. So be it. As the problems seem insurmountable in the instance of God's people and within each fragment reflecting unto God his own image--let us share a thought put forth by a writer of your day, regarding problems. "What makes life difficult is that the process of confronting and solving problems is a painful one. Problems, depending upon their nature, evoke in us frustration or grief or sadness or loneliness or guilt or regret or anger or fear or anxiety or an­guish or despair. These are uncomfortable feelings, often very uncomfortable, often as painful as any kind of physical pain, sometimes equaling the very worst kind of physical pain. In­deed, it is because of the pain that events or conflicts engender in us that we call them problems. And since life poses an end­less series of problems, life is always difficult and is full of pain as well as joy. "Yet it is in this whole process of meeting and solving prob­lems that life has its meaning. Problems are the cutting edge that distinguishes between success and failure. Problems call forth our courage and our wisdom; indeed, they create our courage and our wisdom. It is only because of problems that we grow mentally and spiritually. When we desire to encourage the growth of the human spirit, we challenge and encourage the hu­man capacity to solve problems, just as in school we deliberately set problems for our children to solve. It is through the pain of confronting and resolving problems that we learn. As Benjamin Franklin said, 'those things that hurt, instruct.' It is for this reason that wise people learn not to dread but actually to wel­come problems and actually to welcome the pain of problems." Cort and Jenny have brought joy and "light" into our world in these last few hours. Last evening (instead of supper) they brought forth a fine and beautiful SON. Surprise!! Never un­derestimate the surprises still allowed unto God! They speak of the naming, for more sure were they of a femi­nine label--ah, but they think of "Luke"--be it known that if this be the birthright it is glory for Luke means LIGHT! Blessings are upon the children as they bring forth the servants of God that the tasks may be fulfilled according to the promise of God. God sends forth Himself as He gifts his children with the promise and fulfillment of "life". Man is but a reed, the weakest thing in nature, but a thinking reed. It does not need the universe to take up arms to crush him; a vapour, a drop of water, is enough to kill him. But, though the universe should crush him, man would still be nobler than his destroyer, because he knows that he is dying, knows that the universe has got the better of him; the universe knows nothing of that. All the dignity then consists in thought. You must look to that in order to rise aloft in wisdom; not to space or time which you can never fill. Strive then to think aright; that is the first principle of moral life. To everything there is a season, and a time to every purpose under the heaven. Blessings rest secure and surrounding to those who hold the LIGHTED WISDOM within and give unto others that glorious allowance of Truth and WORD that confu­sion enters not lingeringly upon the pathway. Amen. For you who will find much of the writing in this issue of CONTACT a bit elusive and all but without your ability to take within--I feel we should offer this following evidence from something quite earthly and accepted in your realms of daily ob­servation, Popular Mechanics, May 1991. By Abe Dane, Science/Technology Editor. Coiled inside virtually every cell in your body is a gigantic DNA molecule about 5 ft. long and 50 trillionths of an inch wide. Spelled out in the structure of each strand is the recipe for yourself. Without it, you would be nothing more than a soup of commonplace chemicals. The human recipe, or genome, is written in rungs that span the spiraling strands of our DNA's double helix. Each rung, or base pair, may be one of four possible types. These form the 4-letter alphabet of the genome. In all, the genome contains ap­proximately 3 billion base pairs--enough to fill a library of 15,000 200-page books. An exact duplicate of this entire library is found in every cell of the body, except for reproductive cells and mature red blood cells. Each cell's library is divided into 23 pairs of chromo­somes, and each chromosome holds one complete molecule of DNA. The DNA molecules are further divided into genes, of which there are somewhere between 50,000 and 100,000 in the entire genome. These genes are what concoct the ingredients of a human. Each contains a sequence of up to 2 million base pairs that is the recipe for a protein. When the gene is active, it directs the manufacture of one of these highly complex polymers within a cell. The nature of the proteins determines the nature of the cell. And we are the sum of the cells from which we are built. Although individual people may seem strikingly different to us, there is actually very little variation within the human genome. The fact that 99.9% of one person's genes are the same as those in any other person is a testament to the overrid­ing similarity of all humans. Yet the differences can be pro­foundly important. Among the possible consequences of varia­tion are about 4000 genetically related diseases, ranging from arthritis to Alzheimers, color-blindness to cancer. [C: GO BACK AND READ THAT AGAIN! SINCE, THEREFORE, THERE IS EVIDENCE RIGHT HERE OF TAMPERING OR ALTERATION FOLLOWING BIRTH PROGRAM. THIS IS WHY GAIANDRIANA (BY THE WAY, THIS IS NOT A TAKEOFF ON ANOTHER SUBSTANCE--THIS "IS" THE NAME OF THAT CELLULAR ENTITY IN POINT) IS VALUABLE--NOT AS ANTIBIOTIC MISINTERPRETATION OR ANYTHING OTHER THAN A NORMALLY OCCURRING SUBSTANCE IN ALL THINGS--BUT AS SUPPLEMENT TO GIVE COMPO­NENT UNDAMAGED RESTRUCTURING OF A MUTANT OR DAMAGED CELL. NO MIRACLE "DRUG" OR EVEN "SUPPORT" SYSTEM--IT IS THE RECIPE FOR REBUILDING ACCORDING TO ORIGINAL CONCEP­TION FORMAT.] Resulting from what amount to typos in an individual's genome, these diseases provide much of the justifi­cation for the Human Genome Projects. If we could refer to a correct, indexed copy of the human genome, the process of finding these typos would be greatly simplified. The result would be easier prediction or diagnosis of disease, and eventually treatments that get to the genetic root of the problem. Without such a reference, the difficulty of finding a defective sequence among the 3 billion base pairs of an afflicted person's genome is staggering. As it stands now, we know where only about 1500 of our genes are located. Thus, there is a mind-boggling amount of material to be sifted through in the search for any abnormality. Because of this, it has been possible to find the typos to blame for only a handful of illnesses. In each case it has taken years of labor, aided by inspired guesswork. The Human Genome Project seeks to change this once and for all by focus­ing tens of thousands of man-hours on one massive 3-phase ef­fort. Phase one will have as its goal the completion of what is known as a genetic map. Such maps are based on the fact that sequences of base pairs located near each other tend to be in­herited together. For example, people with hemophilia (a disor­der that prevents the blood from clotting normally) very often are color-blind as well. Through a rigorous process of observation and inference, such groupings of characteristics can be turned into a sort of map indicating which genes are close to each other and which are far apart. Built upon the framework of the genetic map will be a more useful index called a physical map. This second phase of the genome project will pick out milestones along the human DNA, state the order in which they are arranged and say how many base pairs lie between them. Completing the map within the five years allotted will demand considerable advances in biotechnology. The cosmids are sorted by a process called electrophoresis, in which an electric current forces them through a slab of gel. Shorter pieces move farther than longer ones, leaving an ar­rangement of segments sorted by size. Once measured in this way, cosmids are put back in their original order by matching up the severed ends. At the end of the process, it is clear where along the original strand of DNA all the sequences of the type cut by the restriction enzyme were located. The unknown stretches between these milestones can be shortened by using DNA probes, which seek out sites along the genome that match their own known sequence. With our DNA thus marked off, the actual sequencing of ev­ery one of the 3 billion base pairs in the genome can begin. Scheduled for completion in 2005, this phase is the third, final and most technologically demanding of the Human Genome Project. Although current technology is capable of base-pair-­by-pair sequencing, it is far too slow and expensive to contemplate for a stretch of material as long as the human genome. Numerous efforts are under way around the world to refine the technology of mapping, sequencing, storing, organizing and ac­cessing the genome's message. As we move along it would seem so very wonderful to have ca­pability of changing disease into wellness when a child is birthed and bears damaged genetic structure which gives physical muta­tion or impairment. Would God object to the allowance of beauty instead of deformity--strength instead of weakness? Of course not--but do you believe your greedy controllers of the planet are Godly enough to use these magnificent and insightful gifts ONLY for goodness and healing? Come now, the whole intent of the adversary is control, enslavement and power. Therefore, if the power-brokers can alter a gene which allows perfection--WHO WILL BENEFIT? WILL THE CHILDREN BEING METHODICALLY DESTROYED IN GHETTOS OF DISEASE BE SALVAGED, OR, THE CHILD OF THE ELITE? IN THIS OVERPOPULATED WORLD WHEREIN THERE IS THE PLANNED ANNIHILATION OF OVER 6 BILLION PEOPLE--DO YOU THINK THE "AVERAGE" CHILD OF A GOD-RESPECTING FAMILY WOULD BE "SAVED"? IF GENES CAN BE CHANGED FOR BENEFIT--THINK HOW EASY IT IS TO CONSIDER THE WIPING OUT OF MASSIVE NUMBERS OF PEOPLE! Not only is this possible and EASY TO ACCOMPLISH, but is methodically being ac­complished already. I am going to offer you another observation through another article shared with us but bearing no infor­mation as to resource, only a dateline of September 1990. I will begin by pointing out in the early reading of this article some thoughts and perspectives so that you can REALLY READ this material. Medical technology is slowly prying open life's genetic con­trol panel and offering us new weapons in the fight against disease. In the near future [C: Always means, already done. ], doc­tors may be able to insert new genes into our bodies, replacing defective ones. Medical science hopes to then cure our diseases [or create new and incurable ones], not just treat them. One example of how far we have come is now occurring. Committees of experts of the U.S. National Institutes of Health are considering a landmark proposal by Dr. W. French Anderson [Name altered over four generations ago.] of the National Heart, Lung and Blood Institute and Dr. R. Michael Blaese and their colleagues. The proposal is to treat children who have a severe genetic disease by inserting corrected genes into their blood cells. The gene had no therapeutic powers, however. It was in­tended to act only as an inert marker. Researchers wanted to track the effectiveness of Dr. Rosenberg's [not altered] inno­vative cancer research and to test whether or not a foreign gene could safely function in the human body. Many scientists hail such experiments as the beginning of a new era in biomedical research. They say gene splicing and THERAPY will become a solid part of the future physician's ar­senal of weapons against disease. Gene splicing is the creative technique of the genetic revolu­tion. It allows scientists to rearrange, remove and add genetic material. In his best-seller, MEGATRENDS, author and futurist John Naisbitt expressed that excitement. He called gene splicing "the most awesome and powerful skill acquired by man since the splitting of the atom". Molecular biologist Richard Mulligan of the Whitehead In­stitute for Biomedical Research sums up the potential meaning of gene splicing: "Given the power of modern molecular biol­ogy, we can use gene transfer to essentially make a cell do whatever we want it to do." In short, "We can play God in that cell." Before scientists can treat disease through gene splicing, they must first identify those genes that are defective. They have al­ready found markers or genes responsible for dozens of heredi­tary diseases. Researchers are also trying to identify genes that may predispose individuals to cancer, alcoholism, arthritis, schizophrenia--AND EVEN CRIMINAL BEHAVIOR. It was like "searching for a leaky faucet in a house some­where in the United States", said one writer. After seven long and tedious years of genetic sleuthing, researchers found the faucet. Those who have cystic fibrosis lack only three of 250,000 individual chemical base pairs that make up the gene. When scientists pinpoint specific genes such as the one re­sponsible for cystic fibrosis, they open up the way for genetic screening. Carriers of defective genes, newborns and even fe­tuses can be tested for defective genes. The power of genetic screening has been applied to a number of diseases. Tay-Sachs syndrome is one example. This fatal disease strikes only Jewish people from Eastern Europe and their descendants. These people throughout the world can now have their blood tested for evidence of the errant gene. Such carrier and prenatal screening tests have virtually elimi­nated Tay-Sachs from the United States and Canada. Similarly, in the Northeast Thames region of London, the number of Indian and Cypriot children with thalassemia, an in­herited blood disease, fell by 78 percent after prenatal tests be­came available in the 1970s. To spot defective genes for all inherited diseases, researchers believe we must map and sequence our entire genetic makeup--our genome. Biochemist Robert Sinsheimer of the University of California at Santa Barbara defines the human genome as "the complete set of instructions for making a human being". To speed this research, the Office of Human Genome Re­search was established at the U.S. National Institutes of Health in October 1988. Their task has been called the largest and most important undertaking in the history of biology. Many scientists view the mapping and sequencing of the hu­man genome as a sacred scientific endeavor. Harvard biologist and Nobel laureate Walter Gilbert says obtaining the human genome blueprint is the "ultimate answer to the command­ment 'Know thyself'". [Commandment???!!?] He calls it the "Holy Grail of biology". The genome project will allow scientists to identify more and more of the defective genes responsible for the perhaps 4,000 known human genetic diseases. Eventually, says Mark Guyer of the NIH's Human Genome Office, people might have access to a computer readout of their own genome. [C: Can you not see that THIS is the method of placing the MARK OF THE BEAST, chelas? A tattoo is nothing--you will be marked genetically and therein lies the incredible plight of it all--NO ONE WILL HAVE CHOICES IN THE MATTER--FOR THERE WILL BE MARKING BY INVIS­IBLE (EXCEPT TO THE "READERS) MEANS THROUGH MYRIADS OF TECHNIQUES. Another question which is flooding through from masses of you readers: "But won't the Gaiandrianas simply re-perfect the mutant cell structures? No, not unless the many gen­erations of mutations are continued by foreign transplants. By this I mean that "if" there is mutation or damage pre­sent--the being would not survive if ALL cells were in muta­tion. Harken back to the origin of the article prior to this one--there is a "Human Genome" blueprint. This in turn means that EVERY body will have some of the original Hu­man Genome imprint--Gaiandriana will only work with THAT cellular structure--not the mutation of alien cell. The perfect "Human" cell, with a working immune system sovereign and individual to EACH production--will overtake the problem cells and actually utilize them for fuel for the perfect (or original) recipe cells. Our personal genetic blueprint might be coded like the infor­mation in the magnetic strip on the back of a credit card, said one medical newsmagazine. This would be "a personalized genetic map" with all of our "health 'land mines' demarcated", augurs Dr. Nancy Wexler, president of the Hereditary Disease Foundation. The ultimate goal is to have accurate diagnostic screens and effective therapies for all diseases with a genetic factor. "Knowing where the gene itself is," explains Dr. Victor McKu­sick, "you can walk into it and see what is wrong with the piece of DNA that is causing the disease." Possibilities are staggering. An unexpected breakthrough here and another one there could propel genetic engineering to a new achievement plateau. The possibility that diseases may be truly prevented, cured and eliminated will continue to drive the genetic revolution. Victims and their families will want new genetic therapies and doctors will try to provide them. 'It' is a terrible disease. It's not fair. Those kids don't de­serve it." Dr. Cavenee adds, "Whatever we do, whatever ad­vancements we make, are for them." To help such children, scientists are engaged in a war against defective genes. Dr. Philip Leder, head of the department of genetics at the Harvard University Medical School has put it bluntly. "We need to reach in and lay our hands on the gene," he says. Doctors are still frustrated when fighting and struggling to remedy diseases. "Drugs and everything else we use to­day...treat symptoms," explains Dr. W. French Anderson. "The only way to get at the basic disease, if the disease stems from a defective gene," he says, "is to correct the genetic de­fect." The genetic revolution is one of the most important creators of the hope that disease may be conquered. That's because it allows us to get at what futurist thinker Marilyn Ferguson once called "the control panel of change". Genetic engineering al­lows us to manipulate the very blueprint of life--our genetic makeup. Dr. W. French Anderson calls this ability to engineer our genes the basis of "medicine's third revolution". [C: Wouldn't you guess, further, it to be the last?] During this revolution, scientists hope diseases will be cured. "Not just treated with blood transfusions, but cured," Dr. Anderson emphasizes. Others are equally excited by the promises of genetic revolu­tion. "We are just beginning a golden age of genetics," said University of California medical geneticist Robert Sparks. Molecular biologist Kenneth Kidd of Yale University calls ad­vances in genetics a medical renaissance. Scientists, lay people, observers and journalists often speak in hushed tones about the potential of biotechnology. Howard A. Schneiderman, a senior vice president of research and development at Monsanto Chemicals, argues that genetic engineering may be "the most significant scientific and techno­logical discovery ever made". Dr. Schneiderman visualizes an incredible place for genetic engineering in tomorrow's world. "Just try to imagine the earth a thousand years from now," he asks. Steam power, electric power generation, nuclear power, fusion power, transistors, lasers, robots, microprocessors will all have long become "historical novelties." However, biotechnology will remain "at the very center of much that we do" in this future society of a millennium from now, Dr. Schneiderman says. But in our time there is, at least, progress toward a solution--and hope. Today, the carrot of living a disease-free life dangles alluringly before our eyes as the stick of disease drives us to manipulate our genes. Parents of children with crippling or fatal genetic diseases look with hopeful reverence at gene therapy as another potential option for themselves or their loved ones. It is an under­standable hope borne, perhaps, of desperation--a reaching out for something, anything that will help in the struggle against dis­ease. Dr. Sheldon Horowitz, a pediatric immunologist at the Uni­versity of Wisconsin Hospital, has cared for children with ge­netic diseases. He says, "Parents look at their kids dying, and anything reasonable they would be willing to try." Man is determined he will learn how to recreate the genetic universe and bring it under his own control. It will, of course, be under the considered intent of his ultimate quest for a dis­ease-free world. We are now living in an advanced phase of our human at­tempt to control the physical world. Alvin Toffler, who has had a profound effect on our thinking about social change, wrote: "Our century represents the Great Median Strip running down the center of human history." We are, indeed, participants in the most crucial turning point of our civilization. Today, man is the center of all things. Man himself is the new god. He will find a way to solve the problems that beset his race. At least, that is what he must convince himself of. Once, humanity endowed wood and stone with its fears, needs and hopes--calling them gods. But in Freud's day, mankind was already bearing its own burden, however unsurely. Freud then looked ahead to our age--the time of the bioengineers he never knew of. [C: This "spokesman" is not even profi­cient at grammar, much less a fragment of "truth".] He said "unimaginably great advances" would "increase man's likeness to God still more" in the future. How right he was! Let's put this all in proper perspective. Some 3,000 years ago people like us actually believed that some wood and stone, man-made god such as Baal could bring the believers abundant harvests and long and healthy lives. A few hundred years ago, the Western World, realizing this, hit upon Option Two. Humans began to believe they had the solution to their problems inside their brain. "Science" became a kind of generic term for the best brains--those working to solve our fundamental problems. They be­came our finest hope for eliminating disease, for example. Our real faith was in man--in his genius and ability. MAN HAD BECOME THE NEW GOD. Hundreds of years from now humans will see themselves dif­ferently. They will look at our age and shake their heads in ut­ter amazement in the same way we might at the ancient Baal worshipers. They will wonder how we could possibly have be­lieved that man alone was capable of solving his own problems of disease, of the mind, of the social order, or politics and war. Today, humanity is hiding from God, though humans are not generally aware of this. For the moment, mankind is not ready to trust in Him. The result is that we are left on our own to devise whatever patchwork solutions we can. The promises of success are hope­ful; the risks of failure or mistaken application are sobering. Whatever the case, the time of an astonishing new awareness is looming for the human race. God intends to reveal himself and put Option Three into operation, saving humans from them­selves and their problems. A new civilization is destined to sweep over planet earth. But it will be the Creator God's way, not man's. In that coming new world, God will give us all the good things the genetic rev­olution promises--long life and health Paul Kroll, The Plain Truth. Let him who has eyes to see--see and him who has ears to hear--hear, and God grant wisdom to see and hear TRUTH for the lie shall enslave and man shall perish from the face of the earth!